In today’s focus on equal rights and race versus gender versus quality talent a lot more focus is being put on what the differences are between people and why they become who they are. Does being raised in poverty affect your adult pay or when will the pay gap end between male and females? A lot of great questions and a lot of studies being done to give answers and find solutions. One of those questions is do women manage their money differently than men? In a way yes, and in a way no. It’s like asking do you manage money differently than your neighbor? In a way yes, and in a way no. That being said there are a few differences in how the sexes manage money. Here are a couple reasons why women manage money differently than men. It is known that women make about 79 cents for every dollar men make. This can add up over time and really affect long term savings and investments. If you make thousands less than your co-worker, whether male or female, you don’t have as much over the course of the year to spread between savings, investments and bills. Throw in supporting a family and that money would be spend differently than someone whose situation is different. It is known that males tend to be more aggressive in everything they do and that includes how they manage money. When investing, they are more apt to move funds with the market, question what gains they are making now and how to make more. Women, on the other hand, tend to look at the long-term picture of what their portfolio could be. They aren’t too phased by the change in stocks or what their rate is at this moment as it may not affect their overall plan. Boys are raised to be tough and be the leader. Girls are raised to be “pretty” and follow the leader. Is this a super simplification of how children are raised? Yes, but that doesn’t mean they are still being raised that way. Social standards that have been set on how boys should act versus how girls should act. Those are changing. How you are raised greatly affects how you manage your relationship with money. If you were raised in a household where your father did all the finances, then you most likely as a woman will let your spouse do the same. It all boils down to financial literacy and the confidence of making your money work for you, whether you are male or female. The more illiterate someone is of how money works and what you should be doing to meet your financial goals the less likely they are to not be in debt and have smart money habits. Are there some differences between how men and women manage money? Yes. Looking at spending habits and going into debt seem to be fairly similar rates between the sexes. Women are more likely to be large individual donors than men. Giving people, especially women, the confidence in what finances are and how they work, will make better investors, borrowers, and givers. 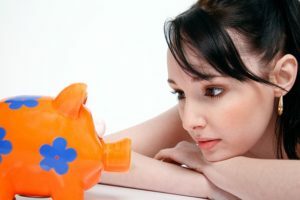 What are some reasons you think women manage money differently than men? Point #2 is especially interesting to me. I see it as an overwhelming positive that we take a longer term approach to investing. See, you’ll mostly hear stories about the people who won big in the market by being risky. So we think that in order to win in the market, we have to be risky like that. But in reality, for every one of those success stories, there are 10+ complete failures. However, if you spread your money out over a few mutual funds, you’re almost guaranteed to beat 99.99% of risky investors over the long term. Plus you’re doing 99.99% less work! So ladies, let’s keep playing it safe! Don’t let anyone tell you there’s anything wrong with it!